Just a Chair and a Drum. In the school where I work, we are fortunate enough to have an abundance of instruments and technology to use in therapy sessions and music classes. We are extremely grateful for this, but I believe that those in a similar situation often take it for granted (I know that there are times when I sure have!). I think it is extremely important for those of us that are blessed with tools and resources to reassess every once in awhile and bring it back to the basics: A drum and a chair. Well for me, that’s what my back-to-basic is. So this week I have opted to bring it back to the basics in all of my sessions (and even this post!). 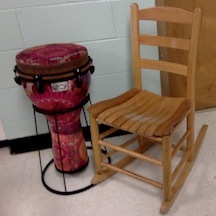 There are so many ideas and interventions that can be done with just a drum and chair. Because we’re going back-to-basics here, I am going to keep it short and sweet on my end but I want your intervention ideas too, so make sure to let us know in the comments below! 1. Play and respond- The client plays a beat and the therapist plays it back and then reversed! This works on social interactions, listening skills, focus, and awareness. If your client is not ready for this, a simple “tap and tap” back and forth to increase interaction and response will work! 2. Drum expression- Simply allowing your client to express themselves on the drum will help with emotional expression and can even help to assist their attention span. 3. Turn taking- Allowing the client to express”your turn/my turn” either verbally, using a device, or signing works on communication skills, social skills, attention skills, etc. 4. Volume Control- Start by showing the client how to play loud and allow them to join in. Then begin playing very quiet to show the other extreme. You could use flashcards with words if the client can read or verbally direct them to play loud and soft. This is fun, engaging and teaches volume control, interaction, and social skills. There are so many more interventions that I could list but I WANT TO HEAR YOUR IDEAS! Comment below with some back-to-basics interventions that only involve one, simple instrument!